Perennial Plants -5 Great Choices For Summer Planting And Lasting Color! When it comes to creating low maintenance, long-lasting summer color, perennial plants are a must. And summer is the perfect time to plant and get them started in the landscape! A few of our Stella D’oro daylillies at the farm. Although annuals like Petunias, Geraniums and Impatiens provide big splashes of color, they can be hard to maintain. Flowering annuals require constant attention, including frequent watering and fertilizing. They can also get quite expensive when having to re-plant each and ever year. That is where perennial plants come through with flying colors so to speak! Perennial plants can help fill in large expanses of flowerbeds with long-lasting blooms bursting with color. They also require a fraction of the care. There are a multitude of varieties that are not only drought and disease resistant, but pest tolerant as well. Of course, best of all, perennial plants come back bigger and stronger every year without ever having to replant. That also means a single plant can be purchased, then divided every year or two to multiply your original investment! It is how we have landscaped our entire farm for nearly free. 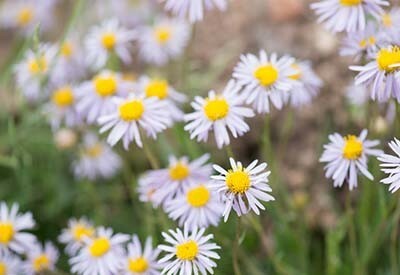 Here are 5 of our favorite choices when it comes to perennial plants that provide long-lasting summer color in the yard. Stella D’Oro – This is an all-time favorite. 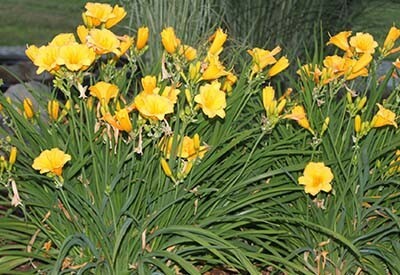 The Stella D’Oro is an incredibly low maintenance perennial, and one that can quickly add color to your landscape. Stella’s will bloom in full glory for a few weeks in late spring, and then will re-bloom in late summer round of color. They are an extremely hardy plant, and can be easily divided, even in the middle of summer! Simply dig up, divide with a shovel or garden knife, and replant. If transplanting in the summer, cut off the foliage to encourage fast regrowth. We love them because they fill beds with foliage, eliminating the need for huge amounts of mulch. When not blooming, their airy grass-like foliage still adds a touch of elegance to beds. Shasta Daisy – The Shasta Daisy is a classic perennial that can add a big pop of white color in the summer and fall. Plants will bloom for two to four weeks or more in the middle of summer. 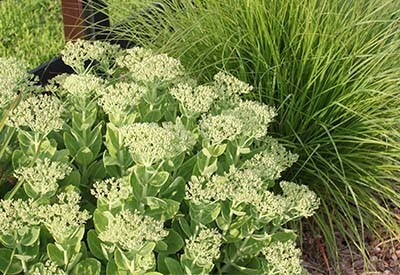 They look great as a stand-alone planting, and also make an excellent addition when planted next to ornamental grasses. Shasta Daisies are simple to divide, and their white petals look great with any additional colors planted. They are also highly resistant to both rabbits and deer, making them an excellent selection for those with animal issues. Black Eyed Susan – Another drought and pest resistant member of perennial plants, Black Eyed Susan’s are an excellent addition to flowerbeds. Black-Eyed Susan’s attract all sorts of beneficial insects, including butterflies and bees. Birds also prize them for the seed heads that mature and drop in late summer. These perennial plants grow to about 24 to 36″ at full bloom height. Planted in groups, they can provide a big pop of color to the landscape, and are easily maintained by cutting back each fall. Sedum (Autumn Joy) – Sedum, or Autumn Joy as it is commonly called, is a hardy plant that blooms from summer to late fall. It is an extremely adaptable, and can handle drought or periods of excessive rain. Their blueish-green leaves add interest and beauty to flowerbeds all year long. Plants grow to 18 to 24″ high at full maturity. The blooms form at the end of 8″to 12″ stems as clusters, much like broccoli or cauliflower. The clusters from in mid-summer, going from light green, to pink, and then to a deep copper in late fall. They can be divided in the spring or fall. We have even transplanted them with success in the middle of summer with a bit of extra watering to help with the shock. 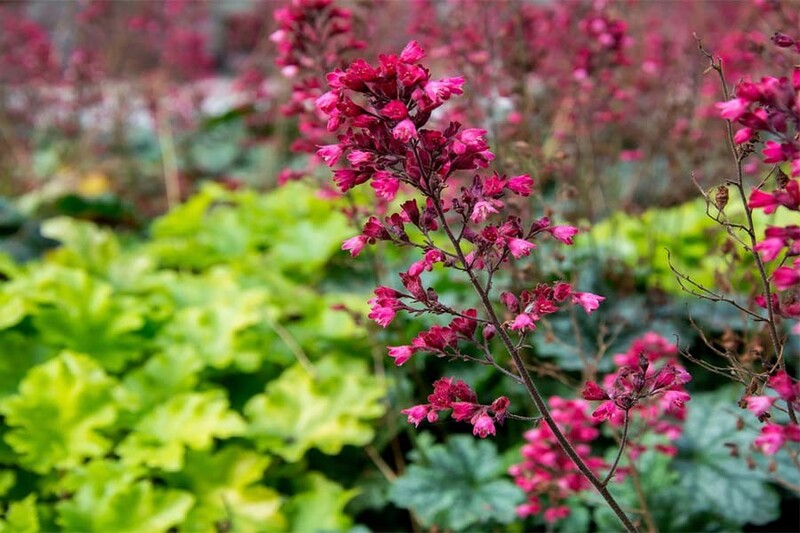 Coral Bell – Coral bells are just a wonderful addition to the landscape. We have 4 different varieties planted around the farm, ranging from red to purple, and two different shades of green. Their long, wispy stems and blooms are a huge attraction to hummingbirds. Their beautiful, low-growing foliage fills space in flowerbeds, keeping mulching to a minimum. Coral bells can be divided easily in the fall or spring, and we have even had success splitting in the middle of summer. Here’s to long-lasting perennial plants – Jim and Mary! If you would like to receive our DIY, Gardening and Recipe articles each week, you can sign up via email at the very bottom of this post. You can also like and follow us on Facebook, Twitter or Instagram to receive all of our latest tips and articles. This article may contain affiliate links. ← How to Can Diced Tomatoes – Enjoy Garden Tomatoes All Year Long! My Hostas are being eaten or something. What’s a good homemade bugs spray I can use?